How to Calculate Waketime Length When Baby Wakes Early. 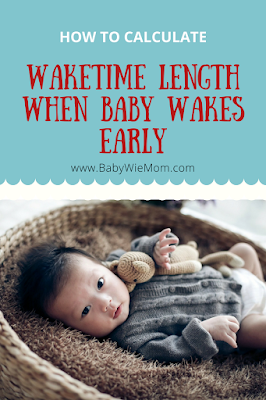 How long should baby stay awake between naps when baby woke early. When your baby wakes early from a nap or in the morning, but you wait to feed them at their normal time, do you put them down so they are awake for the right amount of time, or do you put them down when they should go down if they slept as long as they should have? The answer to this would depend on your child. It depends on how long he/she can stay up. It would also depend on how early they woke up. It will also depend on the age. The older they get, the less crucial it is to go to sleep after so many minutes of waketime, but timing of naps remains important with my 2.5 year old. Most babies will need to go down after the appropriate amount of waketime (actual time they have been awake) rather than the time they would normally go down. No matter the age, don’t keep them up too long. It will backfire. Your child is more likely to sleep longer if he isn’t overly tired than if you put him down later (see Easy Nap Fix). You need to figure out the best thing to do for your child, and you need to maintain flexibility. Your child will change over time. At 8 weeks, Kaitlyn needed to go down after being awake for an hour no matter what. At 7 months, if she wakes up 30 minutes early I can wait and put her down at her normal time with no problems. What about when they wake up after only 20 or 30 minutes of sleep? Do you let them CIO again or get them up? In that situation I would let the CIO again. Kaitlyn did that for a bit, and I finally decided she needed to CIO and go back to sleep. I only had to do that a couple of times. You know they aren’t hungry. If your baby is young (under 3 months), you could try swaddling. I know Brayden would wake after 15 minutes because he would startle himself when his arms would fling. Question about wake time: My little Jack (almost 4 mos.) will not always sleep until his next feeding. I think I read in Babywise that you just take into account that wake time after he eats and put him down a little earlier after he eats–but that’s my problem. Then his whole schedule gets off, and he ends up being awake too long (as to avoid putting him down RIGHT after he eats)…any suggestions? What would YOU do? This is a hard one! I hate it when this happens. Here is what I would ideally do:say he gets up at 10:30 but shouldn’t eat until 11 and he can have 1.5 hours of wake time. He normally would go down at 12:30. Since he got up 30 minutes early, you would put him down 30 minutes early. This is hard because then you are ahead of schedule. BUT, if you put him down late, he will most likely wake early from the next nap, too. You best bet for a good nap is to get him down in time. You would then try to get the schedule back to normal over the next couple of feedings by adding 15 minutes to each cycle. Oh, thank you so much for your answer to Lindsay’s question. I am having the same problem. Also, thank you thank you thank you for this blog. The books are amazing, but I needed more. So this really helps. It is possible he will sleep more consistently after dropping the DF. He also might be waking for a growth spurt or the random 4 month problems (see 4 month Sleep Problems). For the naps…that looks iffy to me. When a 4 month old goes to three naps, he has three naps at consistent intervals all day and then a longer chunk awake in the night. I think this will make him overly tired. My two aren’t on the same napping schedule yet and they are 16 months and 3 years. They are pretty close for the afternoon nap, but you can’t expect the same length and time of nap as a toddler for a 4 month old. Previous Post What Are the Benefits of Sleep Training? Next Post What Age Do Babies Get Easier? I’ve searched for this question and although it’s probably here somewhere, I can’t find it. My 3 month old’s napping is impacted by the 45 minute intruder. I rock him to sleepy and put him down content for each nap, and then have been letting him CIO to extend the sleep (my goal is 1.5 hrs in 2 naps and a 3rd 45min nap – he sleeps 12 hours overnight). He might cry/fall asleep on and off for 20ish minutes before falling asleep for good. The problem is that this will cause him to sleep into the next feeding. I suspect I should wake him to keep him on schedule, but I hate to after making him CIO to extend the nap. He is eating 7 times a day (including the dreamfeed), but he hasn’t dropped his 5amish waking so I’m not about to let him drop a daytime feed. The only places he will fall asleep and sleep soundly are in my arms or his crib so using the swing isn’t an option. Any thoughts? Thanks! I made a mistake to the above. He actually typically takes 4 naps a day. His fourth is a little cat nap typically sometime around an hour before bed time and typically in the baby bjorn. Since he is falling back asleep, I would just continue what you are doing and then wake him up when it is time to wake up. Before too long, he should be able to sleep through.As a word of caution, 3 months is a typical growth spurt time, so if he hasn’t had one yet, be sure that is not the reason he is waking early. with regards to wake time, we’d like our little guy to get up at 730, however he consistently wakes up earlier and earlier sometimes around 645. He will usually make a little noise and then once the annoyed talking starts, the cries are quick to follow. How do i get him to wait until 730 to “wake up”? (he is 9.5 months old). Hello! I’m thinking that bw is just not going to work for my 6 month old boy 🙁 but before I give up on it all together I would like to ask help one last time. I don’t know how else to do but be very descriptive. My 6 month was sleeping through the night at 4 months and taking 3 naps a day (45 minutes, 1.5 hr, and 45 minutes) We went on a two week vacation and have never been able to get that back. Currently he wakes up one time at night and has stopped taking naps all together (meaning he will take a 45 min nap and then only nap 15 min for the next two). He is on a 3 hr/3.5 hr schedule currently. He eats at 6:30, gets cereal, and then falls asleep at 8:15. I then feed him at 10:00 sleeps at 11:30, 1:00 sleeps at 3:00 , 4:00 (with veggies at this feeding) and then last feeding is 7:30. The times I put him down for naps he is exhibiting tiredness, by rubbing his eyes and being fussy and usually falls asleep with out crying. We let him cio for two weeks straight at night and every night he would wake up at 4 and cry for 2 hours before falling asleep and then waking up at 6:30. I just recently started feeding him more during the day and the last couple nights he has now woken up at 5 so I figure he is just hungry and feed him at 5. I haven’t been giving him a full feeding at 5 because I don’t want this to become his first feeding of the day. With naps I am totally at lost. I have no idea what to do. I have tried putting him in a swing, giving him a pacifier, sleeping with less light, not in his crib, in the carseat, outside, inside, ect. ect. I’m at a total lost. This bolg has been so great and I appreciate you taking the time to do this. If there is any advice you can give me or help I would really appreciate it. My daughter is 12 weeks, she has reflux and is on meds and also attends daycare from 0700-3pm daily, M-F. We have been doing BW from the beginning and it seemed at 8-9 weeks all was going well with nighttime sleeping (ie dream feed at 10pm then waking at around 3am to feed and then first feed of the day at 6am). Over the last 10 days there has been a shift and she is now waking after her 10pm DF at 0130 fussing (will feed but seems to be more to sooth than out of hunger), then waking again at 0430 (we sooth w/ a paci) and finally I wake her or she wakes on schedule at 6am. The daytime schedule looks on average like this: 6am wake/feed. dropped at daycare 7am – they feed her at 0900and 1200 and at 3 my husband picks her up and feeds her at 3pm. They have not yet got on board w/ feed-wake-sleep, so her naps are sporatic, often immediately after a feeding and she usually has two 1 hour naps during daycare. Once home My husband feeds her 300 and she is down usually around 430pm and sleeps until her next feed at 6pm. Though the 6pm feed is not meant to be a DF she is often VERY difficulty to wake and is back down for the night between 645-7pm and then the cycle starts over. I am concerned she is getting too much evening sleep to get an adequate nights sleep. I would greatly appreciate your input because I can’t sustain this much longer. Stephanie, I am really sorry that I didn’t see your post until now. Please don’t hesitate to ask if you have questions still. Steph, This sounds like there are many possible contributors.First, I would look into her meds dosage. At 3 months, there is a growth spurt, and most doses are based on weight. At 3 months, Kaitlyn started to not sleep well. We upped her dosage to reflect her new weight and sleep was great after that. So I would first look into that.Next, she is at an age where many babies start to have trouble sleeping because the pacifier interferes with it. You might consider getting rid of that, or accepting that it will interefere with sleep until she learns to control the pacifier herself (usually around 6-8 months). If you want to use it but need help with ideas to use it well, see the post linked in this post: Pacifiers : http://babywisemom.blogspot.com/2008/04/pacifiers.htmlAnother problem could be that her daytime schedule isn’t set enough that it is causing problems for her sleeping at night. Sleep begets sleep. She could be starting her night sleep early because she is tired from the day, and then interfering with night. Or she could just not be sleeping well at night because she isn’t sleeping well in the day, and the two are related. We are having problems with Brady waking early again. I really don’t know what to do. For the past 3 weeks, Brady has been waking anywhere from 5:30 – 6:30 in the morning. He had that bout about a month or 2 back where he did this, and then he stopped and was sleeping until his normal time of 7:30. Now he’s started it again. The only thing that has changed is that we have a new nanny. However – he’s napping fine during the day and acting fine. A couple weeks ago it started with him just waking and talking to himself, and he would just stay awake until I went and got him. Sometimes he fell back asleep, sometimes not. But now the past 2 mornings, he has been waking crying. I don’t know what’s going on. I guess it could be teething, however like I said he’s napping fine and is not fussy during the day.He’s taking 2 naps, around 1-1.5 hours each. Any suggestions on what’s going on or what to do? Sorry, can you remind me of how old he is? He just turned 1 on Monday. For the past couple of days, it has been around the 6:30am time frame. Hmmm…I am not really sure with that age. It could be teeth and it is just that by morning his teeth are really starting to bother him. I would look into how he is eating in the day–but be aware that most kids around 12-14 months seriously decrease their intake in the day.A new nanny would be a big change. It could easily be that and he might just need some time to adjust.One thing to keep in mind is that at that age and with his consistency as of late, there is a reason for him to be waking early. The trick is finding and fixing it. I know – and I cannot figure it out. Everyday he wakes up around that time. He’s not hearing one of us, because we’re sleeping. I just can’t figure it out. I guess I could try to put him to bed an hour early – at 6:30, but I can’t imagine he’d sleep 13 hours. Do you think he’s getting too much sleep during the day? This is just driving me nuts because I know there’s somethign going on and I can’t figure it out.He’s eating pretty normal during the day. It may just be teething because when we went through this before I think it was around the time that he got some teeth. But that’s a pain because I can give him Motrin when he goes to bed, but that doesn’t last until the morning and he doesn’t have a problem until 6:30.He sleeps with his ‘teddy’ which is a little blanky. Maybe I should try to put a stuffed animal in there or something. Thanks for the advice!! I think it may be the teething. He is cutting a tooth right now, so it will be interesting to see if he goes back to normal time after it pops through. My 9 week old daughter is just learning to sleep through the night. I put her down after her 10pm feeding & diaper change, she falls asleep no problem & wakes around 5am grunting & whining I would prefer her ideal morning feeding to be 7am – do I feed her anyway? Do I check on her (this usually make her cry worse) Do I let her cry it out even though I can't sleep through it? Do I put her mobile on? I don't want to teach her that 5am is wake time. Thoughts?! Hi,I need some help with waking early too. We have had nap problems with my 7 week old for the last month but this week she has taken to waking after 1 hour for every nap. She will not resettle herself- do I leave her to CIO? Is she just too young for that? I have tried but she won’t go back to sleep once she is awake during the day (we don’t have this problem at nighttime). She is getting overtired because she won’t resettle and so it becomes harder to settle her again. If I am walking her in the pram, she will resettle and if I go and rock her, sometimes she goes back to sleep but not always. We do not have a swing and I have read all the other blogs. I just need some advice. Also I read that the 45min intruder rears its head again at 4 months of age. Will we be dealing with waking early until then or will she learn to resettle between now and then? Heather,First, you need to be sure she isn’t hungry at 5. It is completely possible that she is hungry at that time. If so, feed her, then wake her at 7 or as late as 7:30 to start the day. McKenna is usually eating around 5:30-6 AM. My desired waketime is 7:30. So I either do 7:30-8:00 AM and we are always back on track by our 1:30 feeding for sure, usually 10:30. Jano, 45 minute intruder is also common at that age. My first thought is the growth spurt that happens around 6 weeks old. If she was previously a good sleeper and nothing changed, there are usually two things to consider. The first is to consider it a growth spurt or need for more food (I have read several authors refering to appetite spurts lately). Feed her each time she wakes. If she nurses, you just feed more often and try to increase milk supply. If she is bottlefed, you can see if she can drink more ounces per bottle each day. The growth spurt can last anywhere from 2-5 days (and I am sure some last longer).The other thing to consider is waketime length and that she might need a longer waketime. But if you think that is it, try adding only 5 minutes at a time. Good luck! Hi! I’ve got a question about my 12 month old. Up until 1 month ago, he was perfectly following my schedule of:7:00 wake9:00 nap11:00 wake1:00 nap3:00 wake7:30 bedHe began cutting molars about a month ago, and ever since then, he’s been waking from his first nap of the day after 45 minutes. It’s really funny, because it’s seriously at 9:45 that he wakes up every morning and screams. (That’s the other thing… he doesn’t usually wake up screaming from any nap, so I know that something has to be out of sorts.) It’s so not like him. I feel like I’ve tried everything… from putting him down 30 minutes later to putting him down earlier. Whatever I try, he still wakes up 45 minutes into it. I’m so frustrated because I KNOW he needs that nap. Plus, the earliest I’ve read on your blog of cutting that nap out is 14 months. I really need him to keep that nap as long as possible because our next baby is due shortly. Any ideas as to what I’m doing wrong?? Also, his afternoon naps have stretched to nearly 3 hours versus the 2 that he was used to having ever since he’s been waking early from his first nap. Should I make him wake after 2 hours on the second nap, so that maybe he’d take the first nap in full the next day?Thanks so much for your help! Katie,If he is waking early because of molars, all you can do is give him medicine or find some other way of alleviating the pain. My guess is that since he is waking early and screaming, it is due to pain. There really isn’t a problem with him taking a shorter morning nap and a longer afternoon nap. That is fine and is a normal part of the transition process toward dropping the morning nap. My son is almost 8 weeks old, he started STTN 7-8 hrs consistently every night just before he was six weeks old, however the past four nights every other morning he has woken at 4:30 rather than the normal 6 or 6:30. Sunday morning he woke at 4:30, then Monday morning he woke at 6:30; Tuesday morning he woke at 4:30, then Wednesday morning he woke at 6:45. I am confused about this because he was so consistent about it, but now all the sudden the last few days he has woken early some days. Do you know why this could be? How should I handle it? I usually wait 20 minutes to make sure he isn't going to go back to sleep, then I feed him, and he always eats well when I do feed him. My son is 5 weeks old – I think that he may be having a growth spurt because he was sleeping previously for about 1.5-2 hrs and now he wakes after 45-50 min. When he wakes, I tried letting him CIO (works when I put him down for nap initially), but the crying escalates after the 45 min intruder. Questions:(1) I have been feeding him when he wakes after 45 min – is it ok to put him back to sleep if he falls asleep after the feeding? In some of the other posts that I saw, it was suggested to start the feed/wake/sleep routine all over again after the 45 min intruder feeding. Sometimes, though, he is more awake and I will start the routine from that feeding. Is it more important to be consistent or go with how the baby acts (sleepy vs. awake?)? If I put him back to sleep, and he sleeps for another hour, do I try feeding him again upon waking (would be only 1 hr between feedings)? (2) Is it possible that it's not a feeding issue/growth spurt? He takes almost a whole feeding, but sometimes I feel like he is just eating because I am offering. I don't want to overfeed, but BW says to first treat the waking as a feeding issue.Thanks for the website and any help! Dulos,Sorry this is so late. It is likely that there was a growth spurt going on. I think what you were doing was good; waiting to see if he really was awake or just tranisitoning and then attending to him. I think after a few days, I would have lessened the amount of time I waited before going. This would be since he was eating well when you went in. That would tell me hunger is an issue. That way, you could go back to sleep sooner 🙂 Another option is to add a feeding to your day in order to avoid the need for food at night. Laura,1-I would keep him up for waketime after the feeding, but be mindful because he will likely need a shorter waketime than usual since the nap was short.2-At that age, I think it is absolutely the best thing to treat it as a feeding issue first. Give it 3-5 days (some say a week even) before looking for naps to return to good. You will most likely start to notice once the feedings are no longer needed to be so close together. At that point, you can evaluate how to proceed. Please help…we recently moved from the Central time zone to the Pacific time zone (2 hours earlier). Since we have been here, both my kids (20 months and almost 6 months) have started waking at or before 6am. We're staying with family while we find a house so there are more adults in the house "helping" with them and so everything with our normal routine is off. My 20 month old has rarely woken before 7am in his entire life and now we can't keep him in bed past 6:15!! My 6 month old is also starting to wake early. She was starting to sleep through the night without a feeding but now one night she is going through the night and then the next she'll wake up at midnight and then 5:30 to eat and then the whole day is thrown off b/c of her wake time. I'm at a loss of what to do…any help is appreciated!!! Hendersons, I think what is happening can be expected. What is 6:15 for you now is what was 8:15–so I think that is normal for them. Expecting kids to sleep later than they are used to is really unrealistic.Of course you can get there; it will just take time (probably more than you want).Ont thing to do is take them outside in the day so their body gets exposed to the sun and resets its internal clock. I have heard to take the child out at noon each day.Also, see the "time change" blog label. All of those tips would apply to you. My 8 week old is going down fine for naps most of the time, but i havent figured out the appropriate waketime because he most always wakes early – like 30-60 minutes in… so I tried extending his waketime to see if he would do longer (because I read that if they wake early its mostly due to not enough time before awake), so I tried 1 hr and 25 minutes, but he still woke up, so do I keep adding it? OR should I lower it? As of this second I decided to see if lowering it about 15 minutes would help, – I fed him @ 604AM, and then put him down for a nap at 708AM… and right now it has been about 40 minutes and he's not stirring… I just don't really know what to do in those situations… :S Thanks. Shannon, I would go check on him, but I would not give him milk. He is old enough to understand you telling him "it isn't milk time right now. It is sleep time." I would, however, let him have some water. He might be thirsty. Hello,Thank you so much for your blog. I have a few questions, and would love your thoughts. I have been trying baby wise since day 1 with my 2.5 month old. The problem is that about 80% of feedings look like this: he'll latch on and eat voraciously for 1-5 minutes or so, then he will pull off and cry and won't eat when I try to bring him to the breast again. He does this after I burp him (even if I get a good burp) as well – he won't go back on after the initial latch, or if he does he's pulling and grunting and squirming and barely swallowing, even if milk is dripping out. He does seem like he's in pain, but usually as soon as I stop trying to feed him he stops crying. For while I kept trying to settle him down and bring him back for 20-30 mins every feeding, but he never really would eat much more. I have been having problems with the EAS cycle because I don't think he's getting a full feeding. He will go down for a nap with a pacifier and fall asleep, but then he is awake and hungry again usually two hours after I initially fed him. I have tried extending the time between feedings so in theory he would be hungrier and eat better (I tried a week where he was on a 2.5 hour daytime routine, where I woke him up if he was sleeping and held him off by holding/rocking/using pacifier if he woke early), but that did not make any difference except that he was madder when he ate. I have tried to watch my diet, and that hasn't seemed to make any difference, although I haven't gone on a completely bland diet yet (the pediatrician doesn't think it's diet-related). He doesn't spit up much, but we thought it might be silent reflux. He has been on Prevacid for over a week, and it may be helping a little, but not much. The reasons I am doubtful it is reflux are that he is usually instantly happy if I stop trying to feed him (even if he's lying on his back), he sometimes DOES take full feedings/longer naps, and the medication isn't making a huge difference. He will sometimes give me a 4 or 5 hour stretch between feedings from about 6 pm – 10 or 11, but after that he is up every 2 hours or so (about 1, 3, 5, 6:30, usually. He generally eats fairly well at 1 and 3, and hardly at all at 5 and 6:30 – just screams for a while). I am losing faith in my judgement about when he is tired, when he is hungry, and when he might just be in pain – I feel that all those factors are playing off each other. I am exhausted as well (my 16 month old keeps me busy during the day so naps don't regularly happen for me), which is the other reason I'm getting discouraged/losing faith in my judgement. The other factor is that he is gaining weight well – 75th percentile, so the dr hasn't been too concerned. Right now, I am generally using a loose EAS cycle, and just feeding him whenever he wakes up from his nap, even if it's not quite a 2 hour cycle, and just trying for 10 mins or so to get him to keep eating, then letting it go. So my questions to you are basically what do you think I should do? It does seem like something's wrong, right? Does it seem like reflux to you, or something else? If it is reflux, how does that work with a BW schedule? I have read the chapter in the book on this topic, but does their advice of going however long your baby can between feeds, just keeping it regular, mean that I should go to a 2 hour routine and wake him up from naps the times he is sleeping longer? I am hesitant to do this because I feel he is overtired and want him to get as much sleep as he can. When I was waking him for the 2.5 hour schedule, he did not sleep any longer at night. Sorry this comment is so long – thank you so much for your time and help! I initially thought it sounded like reflux. If it is, see the reflux posts on this blog.I would feed him if he needs it at two hours, but if he sometimes can go 3 hours, I would let him do that. Something I find confusing, though, is that he is eating seemingly so little and yet in the 75 percentile. It would seem that what he is eating is sufficient for him–but 1-5 minutes does not seem long enough for a child that age. I think it could be reflux, but it is hard to tell from just reading this post. Remember prevacid is weight dependent, so you have to make sure it is the right dosage for his weight.